Soon we entered Fiordland National Park, where we were presented with fresh rivers and rugged sheer mountains. Fiordland National Park is synonymous with waterfalls and brooding fiords and today was no exception. After heavy rainfall in the surrounding mountain ranges a multitude of small waterfalls cascaded down the sheer rock mountain sides. 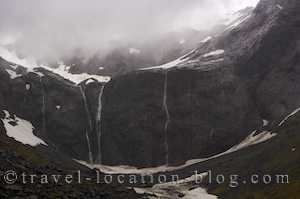 By this time the weather had deteriorated into more rain and there were fresh waves of water filling the waterfall chutes as we watched, and the gusts of wind almost blew the waterfalls backwards. Despite the wet and cold conditions, we decided to take a walk to The Chasm, a place where the Cleddau River is squeezed through a narrow "Chasm" while dropping several metres. The force of this process has sculpted and hollowed out basins in the soft rock. Today, after the torrential rain, the river was roaring through this narrow gap. We found a camp site at the Milford Sound Lodge, although it looked more like a campervan park than a wilderness camp site and drifted off to the sound of heavy rain both inside and outside the camper (since the camper still leaks like a sieve).